When I think of Carine Roitfeld I always think of her timeless style, most of the time in just a pencil skirt, shirt and heels with her signature smokey eyes. Her style is ageless and effortlessly chic, there is definitely something about the way french women dress. 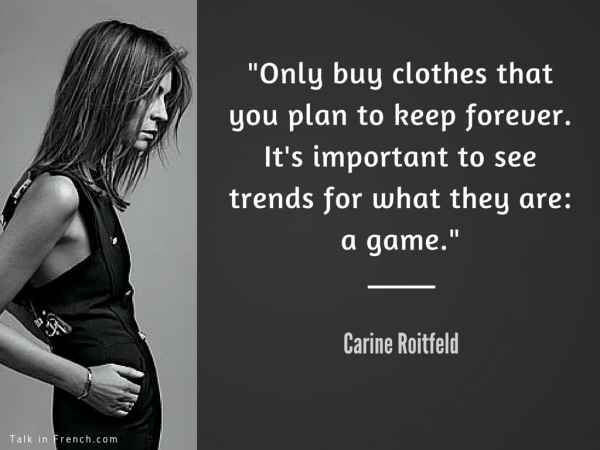 For those of you that don't know Carine Roitfeld, she is a global fashion icon and is the former editor-in-chief of French Vogue, where most of us know her from. She is now the founder and editor-in-chief of CR fashion book. Thanks to Uniqlo, dressing like a Parisian couldn't be easier. Uniqlo has collaborated with Carine with a collection of modern style that is 'intended to bring out a woman's inherent beauty with polished cuts and high-quality material'. The new collection is to be released tomorrow and the best thing is, it's at affordable high street prices. Uniqlo is a one shop place for essentials, and although it may not be fashion forward it does have your wardrobe essentials from your basic tee to a cashmere jumper. This collection has some of the essential items I have talked about in my previous posts, which include the tailored black jacket and tailored trousers. Click on the link here for the full preview, but here are a few of my favourites below. Great article on here on how to dress like a French woman.